With Ecuador’s diverse geographical spread and enchanting landscapes it’s hard to pinpoint the best place to live in this little country. It’s all down to personal preference and there is an area to suit everyone’s tastes. Here are some of our favourite areas in Ecuador. 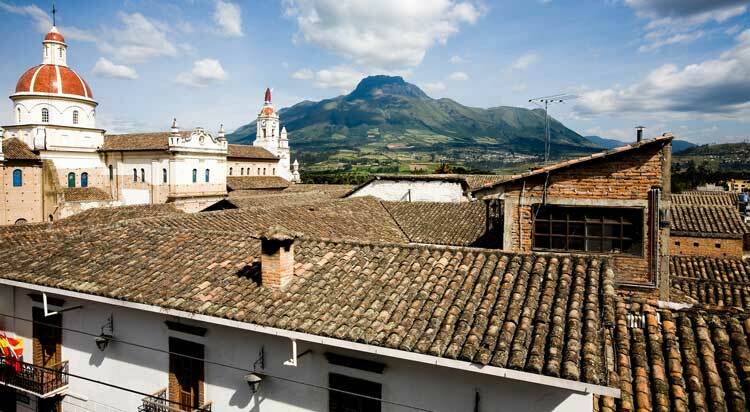 Located in the Imbabura province, Cotacachi is popular with expats. Foreign residents coming here because of the beautiful scenery, low cost of living and relaxed, small-town atmosphere. Cotacachi is famous for its leather goods. You can find any type of leather item you could want in the artisan shops that line the main street, from shoes and jackets to purses, bags and suitcases and even furniture. At night the artisan shops close and only a few restaurants and small mom-and-pop shops remain open. Families gather around a hot grill, where ears of corn are roasting along with pork and chicken kabobs. The faint smell of wood smoke, roasting corn and eucalyptus hangs in the cool air. Eucalyptus trees and palm trees grow wild here. Vilcabamba is located in the southern province of Loja. Once referred to as the Sacred Valley by the Incas, today it’s called the Valley of Longevity. The clean, small and friendly villages has attracted an expat community numbering almost 200. The area is provided with clean water by crystal-clear streams that run down from the nearby cloud forest. At an altitude of about 1,524 metres, Vilcabamba has a wonderful climate. You’ve got glorious weather in the 20s all year, which means that there is no need for heat or air conditioning. 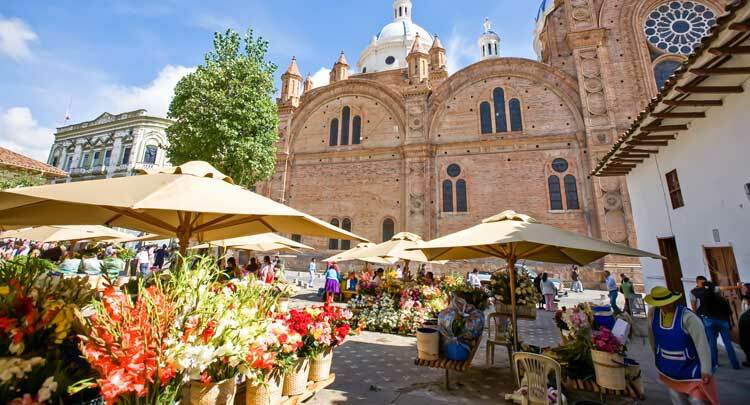 Cuenca is famous for its colourful festivals, distinct food and breathtaking scenery. One of Ecuador’s three UNESCO World Heritage Trust sites (the others are Quito and the Galapagos Islands) Cuenca respects its history and colonial past. Cuenca’s heritage is so well preserved due to the fact that it was not connected to the rest of Ecuador with a paved road until the early 1960s. Today, Cuenca has built strong infrastructure and an efficient public transportation system. In Spanish, Cuenca means “basin” and the city sits on a plateau surrounded by mountains. The Tomebamba river, just one of the four found here, runs right through the centre of town. Cuenca sits high at an altitude of 2,529 metres, high in the Andres and its residents enjoy year round spring-like weather. Temperatures rarely go beyond highs in the 20s C and lows in the teens C. Rainfall averages around three inches per month. Cuenca has two “seasons”, rainy and dry. The rainy season (from January to May) features warm sunny mornings and frequent afternoon showers. During the middle of the dry season (June through December), there are long periods of chilly weather and overcast skies. 75% of Cuenca’s 580,000 population live outside the historic centre in what is called New Town. With a mix city suburbs and modern mid-rise condominiums Cuenca has four malls, numerous hospitals, grocery stores, cinemas, plus numerous restaurants serving a wide variety of international dishes. Most expats in Cuenca don’t own a car and instead favour walking and public transport. The average taxi fare is $2.75 to $3.40, and bus fare is only 35 cents (17 ½ cents for seniors). A rapid rail system is due to be completed in 2016 and will get rid of many of the buses from El Centro which will cut down on diesel pollution. Plans are being considered to convert a large area of downtown streets to pedestrian-only. New play areas for kids and exercise equipment for all ages are being built throughout the city. While cobblestone streets are being repaired construction crews are burying utility lines and upgrade the sewer system. And new bike lanes are showing up all over town. Known as the artistic mecca of southern Ecuador, artisans produce fine leather goods, custom made guitars, filigree jewellery, ceramics and an variety of other high quality products. The famous Panama hats are also made here—they originated in Ecuador, not Panama. As the number of foreign residents has grown—it currently stands at an estimated 5,000—so have goods and services catering to their tastes. Expats run a variety of business’ including restaurants, hair salons, massage parlours, computer repairs and real estate companies. 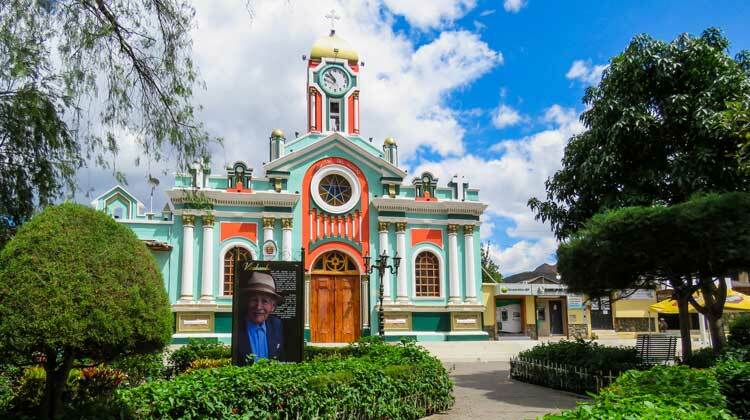 Cuenca’s many benefits are obvious to those that live there but the things that draw them to the area first are an affordable cost of living, quality healthcare and cultural amenities and modern conveniences. 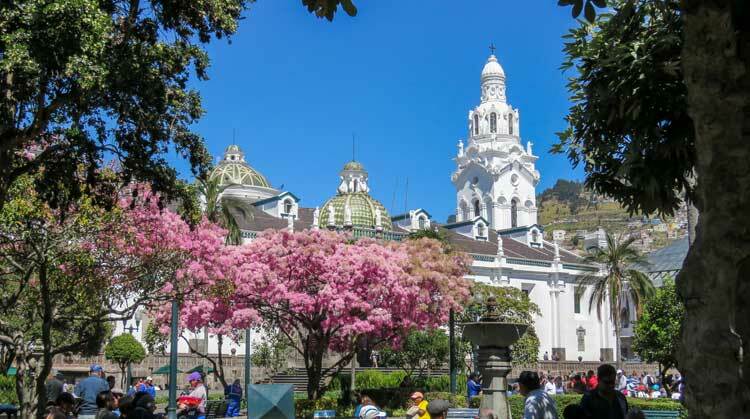 Quito is a beautifully landscaped city with so many parks and plazas that it is hard to choose just one. Quito boasts the largest urban park in South America. Bordering the Bellavista neighbourhood is the 14,000-acre Parque Metropolitano. This park is a nature lover’s paradise. Here you can hike through the maze of forested paths and breath in the eucalyptus and pine scented air. Up until now, one particular area of Ecuador has been overlooked—and that’s its 1,507 kilometres of Pacific coastline and its beautiful mainland beaches. But all that’s about to change. The Ecuador tourism and government officials are going all out to promote the country’s breathtaking western coastline with new infrastructure projects. The opening of a new bridge over the Rio Chone has made the coastline more accessible. Imagine the mountains cascading right down to the sea, with rocky cliffs and wide deserted beaches…and you’ll have some sense of the beauty of this coastline. 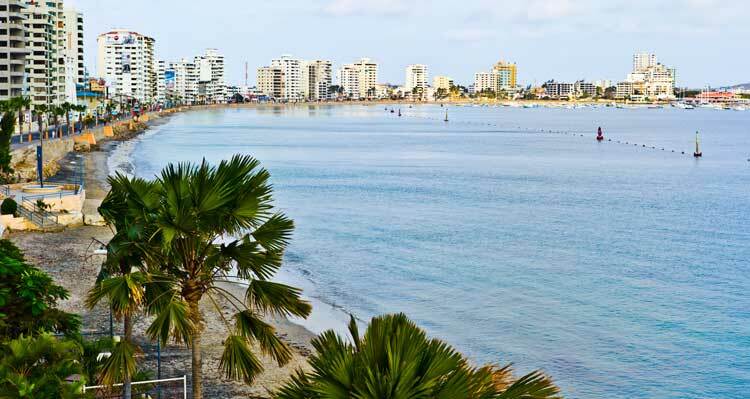 Salinas offers one of the best real estate markets in Ecuador and numerous white mid- and high-rise condominiums can be seen curving around the crescent bay. During holiday season such as Semana Santa (the week before Easter), Christmas and New Year these condos and the surrounding hotels are full to capacity as the population of the town grows from 40,000 to 100,000 for the celebrations.